Dolly shot over peoples heads of a large festive pavilion filled with people swing dancing to a live band. 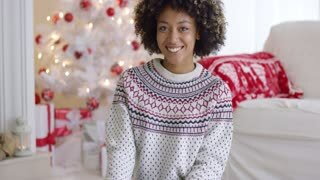 Laughing attractive young woman in a Santa hat offering a large Christmas gift tied in a bow to the camera in her festive decorated living room. Smiling friendly woman offering a large decorative red Christmas gift to the camera with a lovely warm friendly smile in a festive living room with tree. Tourists walk along the river filled with oriental paper lamps on festive night.